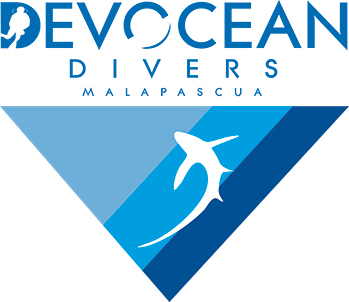 Dive center information - Devocean divers "in the deep we connect"
Our dive center has a wonderful location, right on the main Bounty beach of Malapascua. The shop is located on the premises of the Hippocampus Beach Resort. The building is spacious and light. 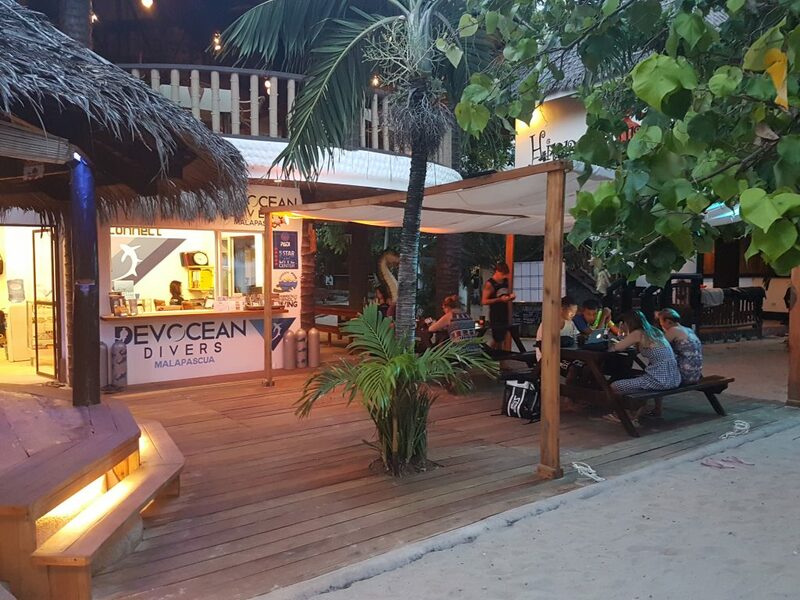 Out front, there are some comfortable tables, chairs, benches and bean bags set up for you to use in the sand or on the big wooden deck before or after a dive. Hang out after a dive and debrief with your new dive buddies. Share experiences and look up the marine life you spotted but had not seen before in one of our fish and critter almanacs. Our instructors also like to teach their students in the shade on the wooden deck or under the trees on the beach in front of the shop. Next to the wooden deck there are fresh water showers available. There are also wash basins to rinse your dive-equipment and sufficient space and hangers to hang up your wetsuit and BCD to dry. At night, your equipment is secured in a wet storage room. If we do leave it on the boat, because for example you had a night dive followed by a shark diving the next morning, then we make sure a crew member sleeps on the boat. Currently we operate 2 spacious Bangka dive boats. A Bangka boat is a local outrigger boat made of wood and outfitted with with bamboo outriggers to the sides for balance. These boats are remarkably comfortable dive boats while maintaining a very local flair. We also operate a large speedboat outfitted with a 75HP Yamaha engine. And there are two smaller flat-boats for transferring divers, equipment, and gear from the beach to the dive boats. After loading one of those flat-boats boat is dedicated to our PADI students to take them to nearby reefs just around Malapascua island. Our dive boats are equipped with first aid kits, oxygen and communication devices. Our dive tanks are 80L aluminum cylinders outfitted with both DIN and INT Yokes. For filling the tanks we use a 450 Liter LW compressor, a Mariner M250 and 200 Liter Mariner on a 9h gasoline engine for when we do dive expeditions. Nitrox 32% is available for those that can provide proof of a Nitrox certification. Nitrox will add to your dive experience at certain dive sites in the area. Especially during the Thresher shark dive as it gives you the opportunity to extend your bottom time and stay down with the sharks longer. More info on which dive sites are Nitox recommended is available upon request. 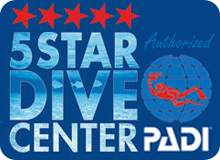 If you are not Nitrox certified, a PADI nitrox course can be arranged with one of our instructors and you could be certified and able to use Nitrox the very next morning. The dive gear used as rental equipment is mostly Cressie Sub and Scuba Pro. We also have some Mares Rover BCDs specially designed to be used as dive shop rental equipment. Our new fins and masks are from the brand TUSA. Most importantly, our equipment is replaced every 3 years.